Bedside Manner offers ideas to make your personality shine! Every health-care school in the nation provides curriculum to train highly competent practitioners to serve the community. However, formal training in bedside manner, the way in which a doctor relates to the patient, is generally underdeveloped. Every practitioner should strive to stand out as the best of the best. It takes a lot of effort to become the best. It’s more than understanding science or excellence at performing procedures. All health-care providers deliver service; what sets the great ones apart is how they deliver it. The way a health-care practitioner delivers patient care is their Bedside Manner. 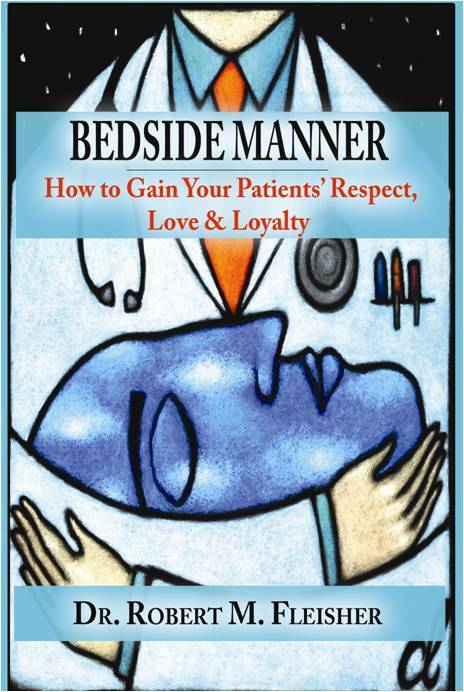 Bedside Manner: How to Gain Your Patients’ Respect, Love & Loyalty explores a multitude of techniques to make better doctors, all based on Dr. Fleisher’s six pillars of great bedside manner: compassion, communication, confidence, character, class and comedy/charisma. Every health-care provider and every patient benefits from a great bedside manner. Through lessons, scripts, the shared experiences of Dr. Fleisher and other specialists and their staff members, and an extra dollop of humor, Bedside Manner guides health-care practitioners of any age through simple steps to improve their attitude, their patient care, their practice, and even the quality of their own lives while also protecting against lawsuits. Seems like a big promise? Bedside Manner is a big idea in a little package (178 pages) that has been executed brilliantly. Bedside Manner is not just about charisma. By developing and instituting practice management systems, Dr. Fleisher teaches how office design, employee and doctor scripts, interpersonal techniques, and the six pillars of bedside manner combine to build a practice and to make sure your patients remain loyal, are kept happy, and love you. Bedside Manner is not just for new practitioners. Any competent practitioner with a sincere desire to provide better care, build his or her practice and avoid lawsuits can do so if they follow the program set out in, Bedside Manner: How to Gain Your Patients’ Respect, Love & Loyalty. Bedside Manner is not just for doctors. Everyone in the allied health-care professions who comes in contact with patients needs to have the knowledge and skills described in the pages of this book. Physicians, dentists, chiropractors, nurses, assistants, physical therapists, nutritionists, are just a few of the practitioners who need to read Bedside Manner. It is page after page of transformative magic. Remember: It is no longer impossible to change your personality. You learned the Krebs Cycle, didn't you? Then you can learn to have a personality. It will take some study and in time it will happen. It is all about learning simple scripts. After all, your personality is nothing more than what you say and how you say it. In Bedside Manner, you will find scripts to help make you a more personable practitioner so that your patients will really, really like you!